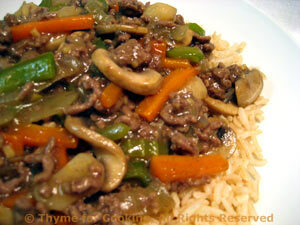 Oriental Beef over Brown Rice, Thyme for Cooking easy one dish dinners. You could substitute thinly sliced flank steak or beef pre-cut for stir-fry if you prefer. Any bits of vegetable left in the fridge would be fine in this: sliced Brussels sprouts, broccoli, whatever. Slice celery at an angle into 1/8 inch slices. Drain and slice water chestnuts. In large non-stick skillet heat oils over medium-high heat. Add onion, celery, pepper and carrots and stir-fry 5 minutes. Add mushrooms, garlic and ginger and stir-fry 3 minutes more. Add beef and sauté breaking it up as it browns. When beef is brown add chestnuts, tomato paste and stock. Cover, reduce heat to medium-low and let simmer 5 minutes. Give the cornstarch mixture a stir to recombine. Turn the heat up under the skillet and add the cornstarch mixture, stirring constantly until thickened. Serve over rice.